You can’t go wrong with classic crime, can you? Well, I don’t think so, anyway! I was kind of up in the air after my read of “The Tiger in the Smoke”, not quite knowing what to read next. So I did my usual trick which is plump for a vintage murder mystery – and you don’t get much more vintage than this! Gladys Mitchell and her wonderful detective Mrs. Bradley have been favourites of mine for years – I owned many of her books in the past, but they vanished in the purge mentioned in my last post which was a mistake, as I’ve now had to re-buy new copies. Truly, getting rid of books is a bad idea. 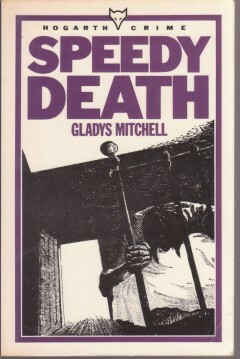 Anyway, “Speedy Death” is Mitchell’s first Mrs. Bradley book, and I have a lovely 1980s Hogarth Press purple edition! The book was published in 1929 and the action is firmly set in that decade by the opening, with two young men meeting a woman from a train. She is Dorothy, the men are Garde Bing and Bertie Philipson, both of whom are in love with her – but it is Garde to whom she engaged. The three drive off to the Bings’ country house where they’re staying for the weekend along with a very motley collection of fellow guests: including the famous explorer Everard Mountjoy, who is engaged to the daughter of the house, Eleanor Bing; Eleanor and Garde’s father, Alistair; the scientist Carstairs, who fancies himself as a detective; and of course the wonderful Mrs. Beatrice Adela Lestrange Bradley, noted psychoanalyst. It doesn’t take long for a guest to be found dead in the bath. Although the host is reluctant to accept this as anything but an accident, another murder attempt follows and the wonderfully-named Inspector Boring comes to investigate. Needless to say, he has no idea, and it’s left to Mrs. Bradley to find out the truth, protect a variety of young women from peril and get to the bottom of everything. Reading Gladys Mitchell is such fun! Her writing is sharp and funny, the setting beautifully conjured up and the characters well fleshed-out. There’s plenty of drama and, as I recall from earlier readings, the plot is quite dark in places, almost melodramatic. The resolution is satisfying and the final action tense, and we are lucky enough to be introduced to Mrs. Bradley’s son! However, there is one plot device, quite an important one, which is never really explained – if you’ve read the book, you’ll probably know what I mean! I don’t want to say too much about the plot because the twists and turns and the denouement are excellent. Suffice to say, it’s as startling as some of the most innovative Christies and that’s high praise indeed. I’d forgotten quite how much I loved Gladys Mitchell’s books and I can see I’ll be spending more time in the company of Mrs. Bradley in the future! If there’s one think I love, it’s discovering a new author, particularly if it’s a Russian one – and I’ve been very blessed in recent years to come across Platonov and Krzhizhanovsky, thanks to wonderful translations published by NYRB. But there are also an increasing number of 20th century European authors coming to light, some quite well-known and some coming back into the spotlight. And many of these are being brought to us by the lovely Pushkin Press, who’ve just come up trumps with another new-to-me author – Gaito Gazdanov. His book “The Spectre of Alexander Wolf” sounded irresistible so I didn’t – resist, that is – and picked up a copy recently. Wikipedia says simply “Gaito Gazdanov (6 December [O.S. 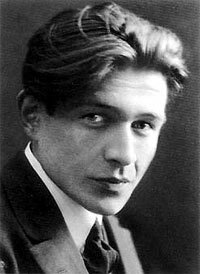 23 November] 1903–5 December 1971) was a Russian émigré writer of Ossetian extraction.”. However, if you read down the entry, he had quite a life – driving taxis for a living, becoming feted amongst the émigré literary community and broadcasting on Radio Liberty amongst other things. 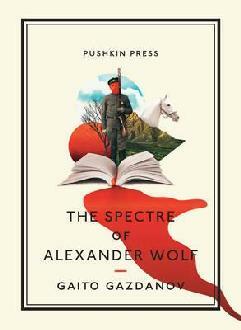 “Wolf” was first published in English in 1950, but this new translation from Pushkin is by Bryan Karetnyk. The premise of the book is intriguing from the start – the narrator, a journalist, is living in émigré Paris, haunted by his past and a murder he committed during the Russian Civil War when just 16. He stumbles across a short story by the author Alexander Wolf which relates the story of the murder from the point of view of the victim in such detail that he realises that his victim must have survived and has written the tale. Needless to say, the narrator is obsessed by trying to track down the elusive Wolf and confront his past. Along the route he meets a beautiful Russian woman with whom he becomes obsessed – to the extent that she is the women of his dreams. Will he meet up with Wolf and resolve the ‘murder’? Will he solve the mysteries behind his lover’s past? When I started reading “Wolf” I was instantly reminded of Joseph Roth’s “Confession of a Murderer” which I reviewed here – the Parisian cafe setting, the murder, the first person narrator. However, this is a very different book. “Wolf” is quite wide-ranging for such a short book, exploring memory, existence and motivation. The protagonist is a strange character, marked for all time by his experiences in the war, unable to shake off the influence of the past. He is somewhat dissociated from his surroundings, not able to relate that well to those around him, and Gazdanov conjures up vividly the strong memory of the murder: the heat, the dusty and the country road; his exhaustion, hunger and thirst; and the almost dream-like quality of the actions that take place. That dream-like ambience will re-appear in the novel, and at times the narrator seems to be existing in a kind of detached, emotional fog. The resolution of the book, and some of the twists also, are almost inevitable (and I did see a couple of points coming) – but that doesn’t detract from the story, which I found very gripping. In fact, it adds to the feeling of the narrator being somewhat out of control of his life, unable to rationalise his life or influence events around him. There is a fatalism about him, as if what is to come is pre-destined and he can do nothing to change it. This was a thought-provoking read, one of those books that stays with you and has you thinking about it for a long time afterwards. Pushkin Press are most definitely to be congratulated for bringing it back into print in this beautifully translated edition, and I hope they’ll see fit to publish more of Gazdanov’s work! So there I was, congratulating myself on getting round all the charity shops in town and not spending anything. There was only one left, in the form of the Oxfam, but they haven’t had much new for weeks so I figured I was safe. And indeed, the Literature section, where I always head, hadn’t changed. However, I foolishly thought I’d cast an eye over the ordinary fiction…. Mistake! 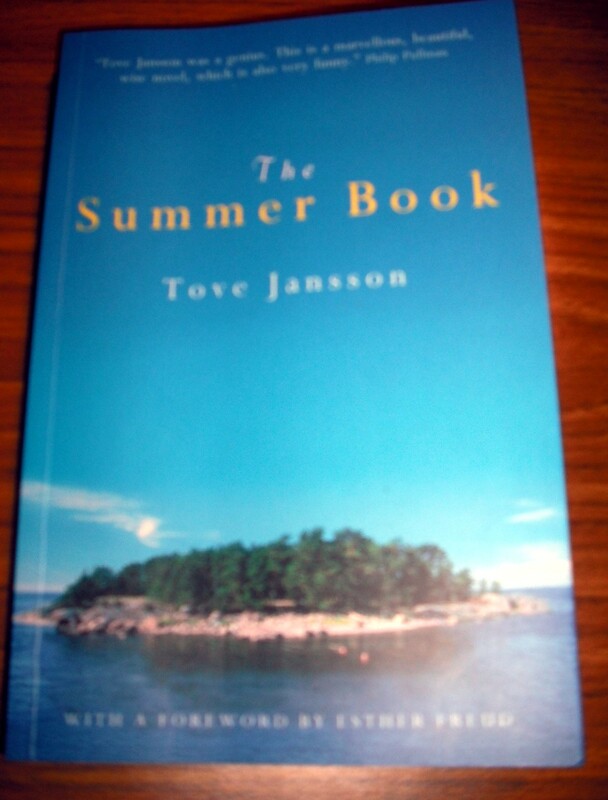 Having just finished my first Jansson book “Fair Play” (review will follow soon, promise – I have a little catching up to do! ), I was obviously keen to pick up another – especially for £1.99 and in lovely nick! As I’ve just watched the really lovely BBC documentary on Jansson, I’m fighting the urge to track down Moomins…..
Roth is on my ‘must-buy’ list when I spot his works in any of the charity stores, and I don’t already have this…..
It’s a Notting Hill Editions book! 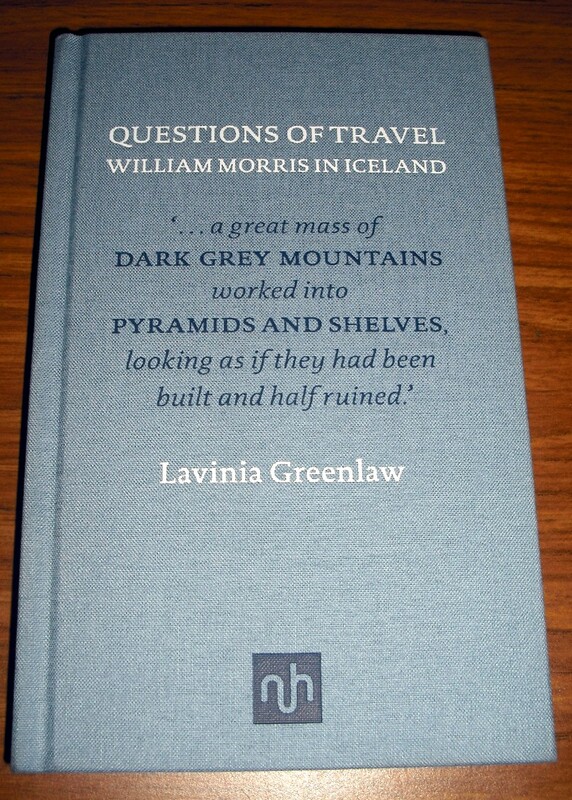 It’s about William Morris travelling in Iceland!! It’s edited and annotated by Lavinia Greenlaw whose “The Importance of Music to Girls” I adored!!! What’s not to love at £2.49? I would only say – who was the twit who owned it before me and turned down a few corners? And why would you want to get rid of this lovely and the others above? Oh well – their loss is my (and Oxfam’s) gain! As for the aforementioned Pelicans – well, I *was* very excited about the impending relaunch as I have a *lot* of old blue versions on my shelves. 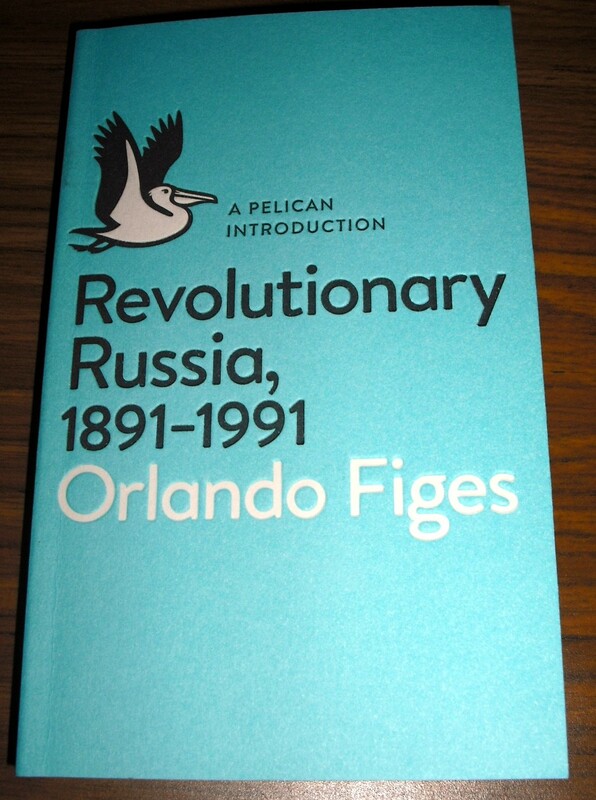 I ordered one of the new ones, “Revolutionary Russia, 1891-1991” by Orlando Figes, to be delivered to my local Waterstones (as there was £2 off offer online) and called in on the off-chance – lo and behold, it was in! Despite not being published till next week! These lovely short pieces are proving just right to pop into when I need a quick crime fix! 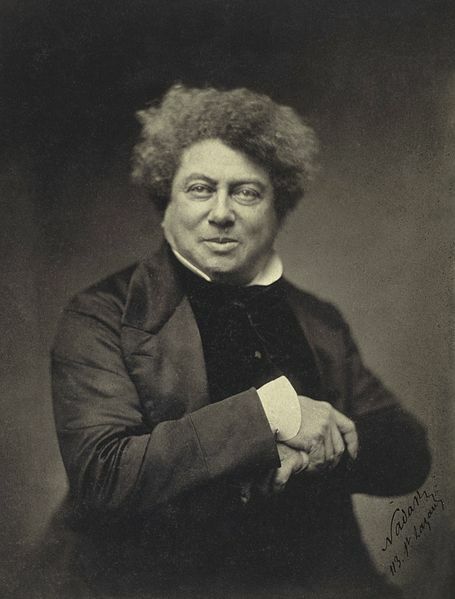 The latest is an another slight oddity, in the form of an extract from “The Vicomte de Bragelonne” by Alexandre Dumas – one of his series of books about the adventures of the Musketeers, featuring that most famous of them all, D’Artagnan. You know what it’s like – you’re vaguely aware of a book for years (well, decades in this case) and you finally decide you should read it – and when you do, you find yourself asking “WHY did it take me so long to read this?” and “This is a book for me – why didn’t I read it before!” and other such exclamations. “84 Charing Cross Road” is just that book – and with my love of books and shopping in that same street I can’t believe I’ve only just picked up this volume! This is *such* a lovely book on so many levels! For a start, it’s a delight watching the relationship develop between the two correspondents – Hanff with her American outspokenness and informality, compared with Doel’s typical British reserve which gradually breaks down as the friendship develops. A real affection builds up between the two, and you just yearn for them to meet and have a real good chin-wag! Then there is the fact that the letters are such a piece of social history – you see the changes taking place reflected in the letters, from the initial bleakness of the late 40s/early 50s, an era of powdered eggs and shortages, alleviated by Hanff’s no-nonsense generosity; to the latter-day missives where Doel talks about visitors to Carnaby Street, and the Beatles. It’s a real eye-opener, showing just how much society changed in such a short time. There is also Hanff’s great love of English literature – her demands for books are imperious and her enthusiasm infectious. And this is a really human story – of how people can reach out and find connections over great distances, finding common interests. Rather wonderfully, this Virago edition also includes Hanff’s memoir, “The Duchess of Bloomsbury Street”. Frank Doel died suddenly in 1968 and that might have been the end of things, had Hanff not had the idea to make their letters into a little book. That little book became a huge success and because of this, Hanff was able to visit London at last, in the early 1970s. Alas, she was too late to visit Marks and Co, which had closed down, but “Duchess” relates her wonderful adventures in London: treading the footsteps of her beloved authors, meeting Joyce Grenfell, being ferried about by admirers like The Colonel and Pat Buckley, and most importantly meeting up with the family of Frank Doel. It’s a lovely, lovely book, full of sharp observations of London, New York humour and once again her great love of English literature shines through. “Duchess” vividly brings to life Britain in the early 1970s, where women weren’t allowed to wear trousers in some establishments and the plumbing was dreadful! 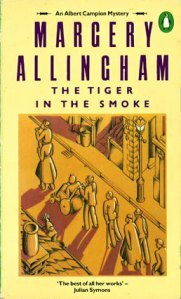 This was one of those lovely reading experiences where you feel you’ve been living alongside someone, following them from the post-war era up until a much more recent time (and one that I can remember!) Helene, Frank and all their families, friends and acquaintances became real, and I didn’t want the book to end. Fortunately, I’ve just found out that Hanff has written another book covering her experiences (off to the online sources I go). “84 Charing Cross Road” is one of those books that stays with you – poignant, moving, funny, entertaining and a demonstration of just how important literature can be in life. I shan’t leave it so long till I read her other book! Well, this is a bit of a change of pace after Enid Blyton and crime novels! But I picked “Transit” up when I was in London recently and it’s been calling to me since – and it’s a lovely NYRB edition so what’s not to love?? Wikipedia says of Seghers: “Anna Seghers (19 November 1900 – 1 June 1983) was a German writer famous for depicting the moral experience of the Second World War.” I came across her name once when looking up Christa Wolf, and was intrigued – Seghers had quite a life, fleeing from the Nazis during the war as she was Jewish, choosing to return to Germany after the war and settling in East Germany because of her left-wing convictions. “Transit” was published in 1951 and was based in part on her experiences during the war as a refugee washed up in Marseille, where many people ended up, trying to escape from the Germans. 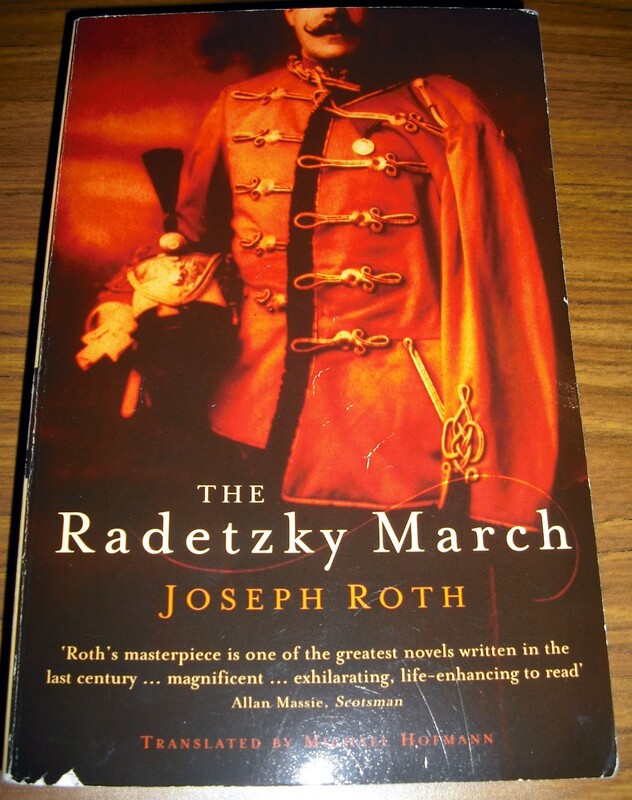 The book’s narrator is an unnamed man, an engineer who is also fleeing the Nazis, having escaped from a series of concentration camps – presumably he had been held because he was left-wing, but his real identity is never really revealed, and in any case identities are fluid in this place. Whilst travelling, he is asked by a friend to deliver a letter to a writer called Weidel, only to discover that the man has committed suicide, leaving behind a suitcase containing personal effects and writings. Taking the case, he travels on to Marseille, adopting another alias on the way, that of a refugee called Seidler. However, once in Marseille the identities become blurred, with the authorities thinking he is one man using both names. As the narrator searches for Weidel’s wife, to hand her the suitcase and help her obtain visas and papers to escape from France, he encounters old acquaintances, fellow refugees, an amazing variety of other characters trying to escape the country, and also his nemesis: a doctor who is the lover of a women who attracts him deeply. Who is she, and will Weidel/Seidler manage to flee from Marseille and the endless maze of red tape which seems to have trapped every character there? It’s hard to sum up this complex, dream-like novel in a few sentences, because it *is* very deep and involved. It would be easy to make comparisons with Kafka and Catch 22 because of the ridiculousness of the bureaucracy and the haze of civil servants that every character has to deal with trying to leave – and bizarrely enough, if you want to stay in Marseille the authorities won’t let you – you have to convince them that you want to leave to get a residence permit of any sort! And there are endless frantic searches for exit visas, transit visas, tickets, money – it’s a nightmare of red tape which has the effect of causing the characters to start to lose their identity. Our narrator is already hazy enough, and with all this shifting of identities, becomes even less defined. He does not seem to know what he wants – whether to stay or to leave; to pursue the woman he loves or not; stay with the friendly family he knows or cut all ties. This blurring is deliberately unsettling and captures beautifully the sense of unreality and insecurity experienced by refugees, those people in transit. Seghers’ writing is beautiful – she conjures up the landscape vividly, whether the narrator is fleeing through France, or gazing at the bay in Marseilles. And this is a novel not just of events but of thoughts – the narrators indecision is a kind of existential crisis, an inability to deal with reality, to know himself and to understand what he wants. We know all along that he will not leave, as the book opens with him still stuck in Marseille and relating his story to a passer-by. Nevertheless it is somewhat chilling to learn the processes he’s gone through to get to that state, watching him struggle with his feelings and trying to understand his own motivations. In many ways he’s an everyman – representing the state of humanity at this point in time, hounded by an aggressive machine so intransigent that it’s impossible to comprehend. The sense of being stateless, having no land where one could rest or belong, was a common one at the time and the state of mind of the characters in “Transit” epitomises this. The movement of people is also part of the human condition, one that’s existed for centuries: human beings are always on the move and always have been, from land to land, continent to continent, exploring, discovering and changing their surroundings. The people stuck in Marseille are simply part of a long history. But there is another strand in the story, which is the search of Weidel’s wife for her husband, the writer. 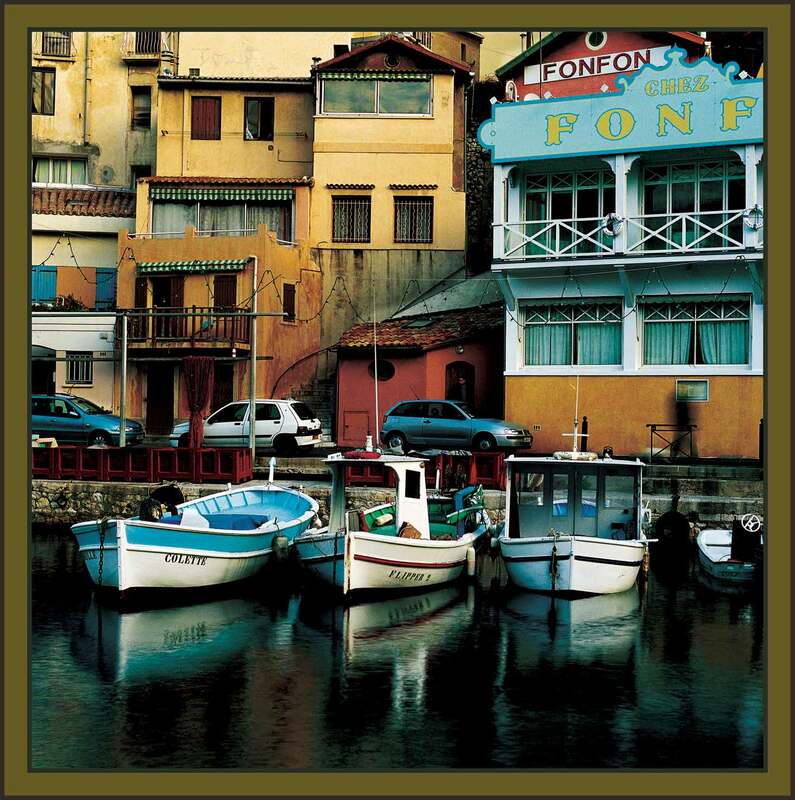 Unaware of the deception being perpetrated by the narrator, she cannot understand why other people in Marseille keep encountering her ‘husband’, while she runs from cafe to cafe, embassy to embassy, just missing him and unable to track him down. Marseille is perceived as a kind of maze, in which people move past each other without seeing each other, where it is impossible to find someone and then you will accidentally bump into them. All of this adds to the dream-like quality of the narrative. In the end, the narrator lets go of much that he thinks is of value, and ends up possibly attempting to take root in the locality. How long this transient way of living will be allowed to carry on is unclear, but he seems to have attained a temporary kind of peace. Who he is, we never will really know, as the multiple, shifting identities he’s taken over have blurred the line between fiction and reality. In some ways, I stayed detached from Weidel/Seidler because of his imprecision – although I became concerned in the fates of the other characters, he never really took hold, as if he was almost a kind of chimera with no real identity. “Transit” is a haunting and gripping novel which is relevant today, in a world which is still troubled by wars and refugees. 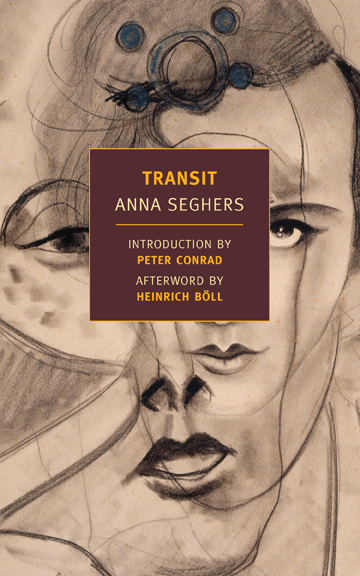 Seghers gets inside the mind of people in exile like no other writer I’ve read, and “Transit” is essential reading for anyone wanting to understand the effect of WW2 on real, ordinary people, reduced to fleeing for their lives. A really remarkable book.